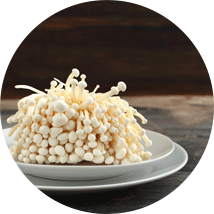 We provide fresh enoki mushrooms for more exotic tastes! Japanese origin, now grown in Australia. Beige to creamy white in colour, with long, thread-like, edible stems topped with a tiny button cap. Enoki have a very delicate flavour but a pleasant, crisp texture. Traditionally, Enoki is lightly cooked, served in soups or stir-fried. It is one of the essential ingredients in Shabu Shabu, the famous Japanese hot pot dish and is equally popular in Sukiyake. 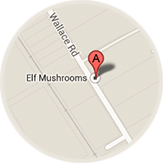 This mushroom contains the water soluble polysaccharide flammulin which has been shown to be effective against certain cancers. Firm, crisp texture. Mild, fruity flavour. Can be eaten raw or cooked. Sold in clumps. Trim approx. 2cm from the base and separate carefully before serving or cooking stems and caps. Serve raw in salads, sandwiches or rice paper rolls. Add to soups, omelettes or risottos, tempura or just before serving.